WooHoo, You're a problogger! er, prolighter! But can you cash a check with all that black all over it? Be sure to make a color copy and frame it! and then my address. But no money. Yay for you and MONEY! 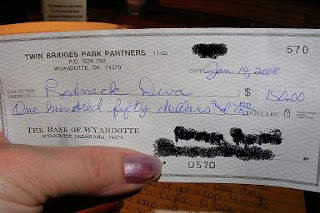 So that's what all those other guys mean when they talk about "Gettin that crazy blog-money!"